Andy Kinder recently confirmed victory during the annual Barston Lakes Christmas event for a second year running! Andy, along with fifty four (54) other anglers, went head to head for a first place prize of £500 on this popular event supported by a talented field. Conditions on the day were ideal with temperatures being a lot milder than in previous days, but a strong wind still did its best to try and hamper angler’s efforts. Below, Andy reflects on another successful trip to the venue, which ultimately ended in another pickup for the Sheffield-based venue expert. “The Barston Lakes Christmas match is an event I always look forward to with Nigel and the rest of the Barston Lakes team doing a great job. As well as hosting the event itself, the team are good enough to provide a Christmas dinner for all at the end of the day as well“. “I was fortunate enough to win the event last year and was hopeful of a repeat performance this time round. I drew peg 58, which is not a bad area, but one that had shown little form in the weeks before the event. There is always a chance of F1’s from this particular area of the lake with odd carp also being a possibility, so I decided to set up my stall to suit“. “I decided to fish two lines; one at 45m and another slightly further out at 55m. I set up a method feeder on both lines offering a variety of hookbaits, but focused my attack mainly around different coloured wafters and maggots (for the F1’s)“. “I had a great match catching well at 45m before switching to my longer 55m line late on in the match to catch twelve (12) F1’s and one (1) lone carp, which went 12lbs“. “This gave me a final weight of 52lbs, which was enough win the match on the day and meant I’d won the event for a second year running“. “I would like to day a big thank you to Nigel for the event and Mark O’Neill for the lift in his van“! 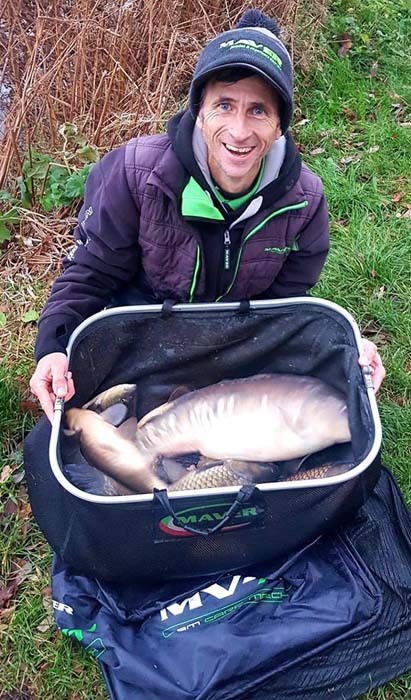 “With another successful event behind me at Barston, the remainder of the year will see me back up at Maver Hayfield Lakes for the Winter Carpa Series“.